Get ready! Today's post is a long one y'all. One of the most requested post topics I've had is how I've grown a following on social media (and my blog). So I wanted to take some time and chit chat about five things I feel are important to cultivating a loyal audience and what I've done to get where I am. I'll say this now... there isn't an easy, one size fits all answer. It's a lot of trial and error, a lot of long nights, a lot of work, but also A LOT OF FUN! The opportunities are endless as an influencer and you have total control of your content. You'll meet amazing men and women from all over the world and even develop meaningful friendships with followers and influencers alike! It's a wild, but very rewarding ride. If I missed anything you're still wondering about please feel free to message me, email me, dm me, send a smoke signal lol, and let me know what you'd like to know! 1. Be uniquely you. You've probably heard this before and it's so much easier said than done. There are tons of bloggers and influencers doing the same things, wearing the same clothes, going to the same places, publishing super similar content. It's a challenge to stand out amongst the crowd. Especially when you feel like you have to be like everyone else to succeed. Take note, I'm not saying you have to be out of this world crazy different. But you have to sprinkle your unique self into everything you do. It's important to be "aware" of what other influencers and bloggers are doing because there are trends in social media and whatever your niche may be you need to be aware of. Take the Nordstrom Anniversary Sale for example. Tons of people post about it over and over and over, because it's a really lucrative time in the spectrum of yearly events and also a valuable time to promote items at a discount to your followers. Not something you want to miss out on (unless it's just not your thing or a place you shop... you always want to be authentic). Being unique can be as simple as your voice. How you caption your pictures and how you talk to your audience. Do you share about your life? Do your followers feel like they are a part of your day to day? Do you share more than just the highlight reel? Those are things that make you "you." Think about what you do well, what you are interested in, how you can make your own stamp on the influencer industry... and slowly but surely, others similar to you will follow. One of my favorite bloggers, Katey McFarlan, said "You shouldn't be everyone's cup of tea," and she's quite right. You want to be unique enough to cultivate a loyal, like-minded following because those are the people that will stay with you through thick and thin, through algorithm changes, moments you feel uninspired, days you go through hardships, etc. etc. etc. With that said, your followers don't have to be "just like you." But they have to feel welcome and part of your world. Inclusivity is so important. You don't want to alienate anyone along the way. It's entirely possible to be "similar" to someone without blatantly copying which I see a lot of around the influencer/blogger pond. For example, I paid for and had highlight icons designed specifically for my Instagram to go with my theme and my brand. Since then, I've seen more than one person steal them and post the exact same ones and that's just not okay. As creatives, we should be more prideful in the content we produce, the pictures we take, and the design elements we publish. Okay... off my soapbox lol. The point is to try new things, think out of the box, and express yourself uniquely while paying attention to what's going on around you. Stay in touch without becoming someone else - because people want to know who YOU are. That's how you grow a REAL following full of people who are actually invested in you. Not automated comment pods, not bots that boost likes... people who followed you because they want to see more. THOSE are the people who will eventually enable you to pursue blogging/influencing as a career. FYI companies look at your engagement rate much closer these days. Having 3,000 likes doesn't matter if your audience isn't engaging (i.e. commenting, asking questions, shopping). And it's really, really obvious that things "aren't quite right" when engagement or likes are skewed. For example, on pardonmuahinsta... I have 65,800 followers with an average of 1,600 likes which is an average engagement rate of 2.4%. Turns out this is in line with the overall average engagement rate on IG. When doing some research I found that influencers with 10,000 - 99,999 followers have an average engagement rate of 2.4% - and statistically this percentage drops slightly as you continue to grow (stats came from here). It doesn't pay (literally) to get ahead and there aren't any magical shortcuts to be had. It takes YEARS of hard work, consistency, persistence, money, late nights, three jobs (i.e. me lol), really, truly caring about your audience, and the courage to be YOURSELF. 2. Publish content consistently. PHEW! So much information to spill today! I want this post to be very honest and informative because blogging and growing a following on social media is really hard work. There's a lot of business savvy that goes into growing a following and growing a brand. Understanding people, implementing good customer service, staying incredibly organized, keeping financial spreadsheets, creating invoices, pitching new ideas, figuring out how to communicate your worth to companies, creating view worthy content, and so much more. One of the best strategies, when blogging and posting on social media, is quite simple. Be consistent. I would bet you $100 if you ask any blogger/influencer about how they attain and sustain success, one of those would be consistency. You work day in and day out to create a following and now YOU HAVE TO SHOW UP. On holidays, when you aren't feeling well, on weekends, in the morning, in the afternoon, in the evening, on vacation, when it's super cold or crazy hot outside. Your followers are counting on you! I in no way say this to make blogging sound negative or to discourage anyone from starting a blog. I say it because I don't think many people know about that side of things. 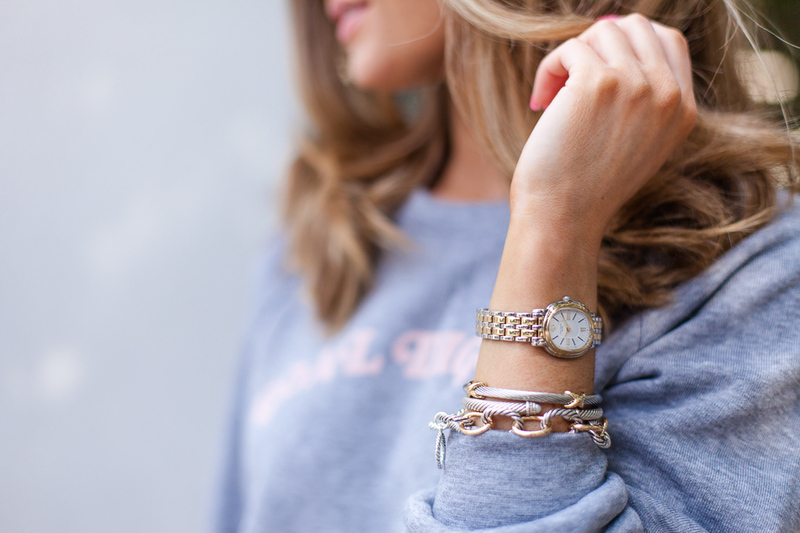 Blogging and being an influencer is so much more than sharing outfits and beauty tips. Many times we show the fun things, the easy things, and not always the behind the scenes things. And I don't necessarily think that's bad. I want Pardon Muah, for the most part, to be positive, light, and fun to read and watch. I want people to feel happy and encouraged! It may sound obvious but posting consistently on your blog, IG, FB, Twitter, etc. is vitally important. Take Instagram for example. The more consistent you are, the better you do in the algorithm (which I know zero about specifically, I just know what I've experienced personally). Your followers want to know you're going to give them new content each and every day and when (or on a consistent schedule for your blog). You want to stay present often. Posting 1-2 times a day is ideal! And use those stories - all day long! I use a tool called Iconosquare to track what times of day and days of the week are best for me to post. I used to post in a pretty scattered pattern until recently. I decided to post at the same time every day of the week (only slightly changing things on the weekend) to see what would happen. And I definitely noticed a more consistent boost. I couldn't tell you exactly why this works better but after looking into my stats on Iconosquare it's obvious my engagement has gone up! 3. Engage with your audience. By now you've heard this word "engage" a lot. But again, it's so much more than likes, and sometimes even more than comments. You want to get to know your followers! I've never understood why an influencer would get annoyed by direct messages from their audience. This is what we do. Our survival rides on the loyalty and following of others - cultivating meaningful relationships is so super important. People want to know you care and they want to feel heard. Disclaimer: There is absolutely a point where you can't answer every dm, comment, and message. There's not enough time in the day and downtime with family & friends has to fit into the mix. So in these cases, I think it's important for followers to be patient and understanding. In the past, I've gotten messages saying "you didn't answer me" or "could you answer my dm" or "still waiting" and that makes me feel pretty bad. I personally, answer each and every message (at this point lol) unless I honestly miss it, it's mean, or it's a scammy business proposal. It's especially important to engage when followers have questions. About fit, sizing, retailer, link, etc. Again, sometimes things easily get lost in the shuffle but try to answer those first! I almost always stop what I'm doing when I see a question come through because I don't want to miss it by accident and sometimes they can be time sensitive (a lot of popular items sell out fast). Nowadays I probably check dm even more than my photo comments. I still check both but dm's are usually messages with a sense of urgency or the start of a great conversation. Speaking of which (get it? haha), have a conversation! Don't be scared to be open and honest and friendly. I know how much it means to me when people respond to my messages - it makes me feel heard and important. It's also a great way to solidify a follower's loyalty, even if the message starts out in a more negative manner. Speaking with kindness and thoughtfulness shows your audience you actually care and that you're there as a resource. Another great way to engage is to like and/or comment on your follower's photos or content. Again, it shows you care and that you want to get to know the people in your community. I know when I see a super successful blogger like or comment on one of my photos it makes me feel giddy and excited! It makes you feel like you're not just a number and they're not just in it for the money or the commission. Lastly, there will, unfortunately, be times when people say things that are negative, mean, or even extremely hateful and I encourage you to resist the urge to comment back because it only breeds further negativity. I personally have no qualms blocking people who have nothing nice to say. Not constructive criticism... we're talking MEAN comments that have no place in a positive community. Your blog and social sites are yours to protect, and from what I've found most of those accounts are fake bullies who don't want to share their face, or they are scam accounts - so no harm is done saying "see ya!" 4. Pay attention to what works. It's also really important to pay attention to what works well for YOU. Much like keeping things unique, you want to take a deep dive into what your audience likes. Do they prefer try-on sessions? Do they like full body shots better than close up details? Do they respond better to professional photography? Are they more active in the morning or night? Are there certain retailers or price points that sell better? All things to think about! I use Iconosquare that I mentioned earlier to help me take a look at what times people respond best to my posts based on likes and comments. I can look at which photos are performing well, and even how other bloggers similar to myself are doing. It's pretty affordable and I've found it quite helpful. It also allows you do pull numerical or demographic information for companies if they request it. Something I'm guilty of is trying to do everything well all the time when it's more productive to focus on a couple things that really work. For example, my try-on sessions do really well so it's worth it for me to invest more time and effort into putting them together. Additionally, candid shots (non-professional) usually do the best so I recently invested in photography equipment to take my own photos during the week when J isn't home and my photographer isn't available. Put your time and effort into what you already know your audience loves! Keep in mind, a lot of blogging and social media posting is trial and error, especially in the beginning. And as your following continues to grow your content will also evolve. Consistency is also important here because people will follow you for certain reasons, so if you up and change everything that may deter them from continuing to engage. I'm talking drastic changes like making your whole feed yellow or going from outfit photos to food haha... we all change our feed themes and play around with lighting and locations! This is a great opportunity for you to express yourself uniquely as I discussed above. Use your strengths to your advantage. Sometimes you have to put your blinders on and focus on doing your own thing. You might see everyone sharing photos of shoes in a circle... but if shoes in a circle don't work well for you, put those shoes on and share a mirror selfie! It doesn't mean you can't share shoes, just that you need to share them in a way that does well for YOU! 5. Network, like and comment. Lastly, NETWORK, NETWORK, NETWORK. Much like I learned in graduate school, relationships you form can make or break your career (or at least help you out in a pinch lol). Social media is all about community and engagement so it's very important to also engage as an influencer. You get what you give and this is certainly true on certain outlets like IG. Take time out of your day to like and comment on the photos of people you follow and people who follow you. Most likely this will be done in return! I try to take at least two hours out of my day to like and comment on other people's photos, in addition to answering comments on my own pics. It's a great idea to schedule this time into your day because you can easily lose track and the next thing you know your online shopping haha! I think interacting is the best part of the job and truly enjoy getting to know new people and to share my love of fashion, style and beauty. When it comes to networking with other bloggers and influencers I like to look for women with a similar aesthetic/style to mine at a similar stage of growth. Not to say you can't become best friends with anyone with any number of followers, but I think it's helpful to be in a similar stage of the game - I find people are more willing to share. It's a good way to bounce ideas off one another and to ask each other questions since you've put in a similar amount of time and energy to growing your following. For example, if an influencer just starting out messages an influencer with years and years of building their brand under their belt, and asks to know all of their secrets to success, that just doesn't seem quite fair. Now don't get me wrong, I think mentorship and supporting each other is very important. And there is nothing wrong with asking for advice. It just depends on how it is done and delivered. A lot of people want a fast and simple answer that unfortunately doesn't exist. And there is something to be said about earning it - putting in the exhaustive time and energy to see what works well for you. PHEW!... if you made it this far then #blessyou. I know this was a super lengthy post but I get lots and lots of questions about how to grow a following and what I've done so I hope this answers some of those questions and can serve as a helpful resource. Blogging and working in the world of "influencer" is truly my dream job and I feel so lucky to be able to wake up every day and love what I do. I don't take a day for granted and hope Pardon Muah will continue to grow and flourish for years to come in the future - thank you to all of you for your amazing support! 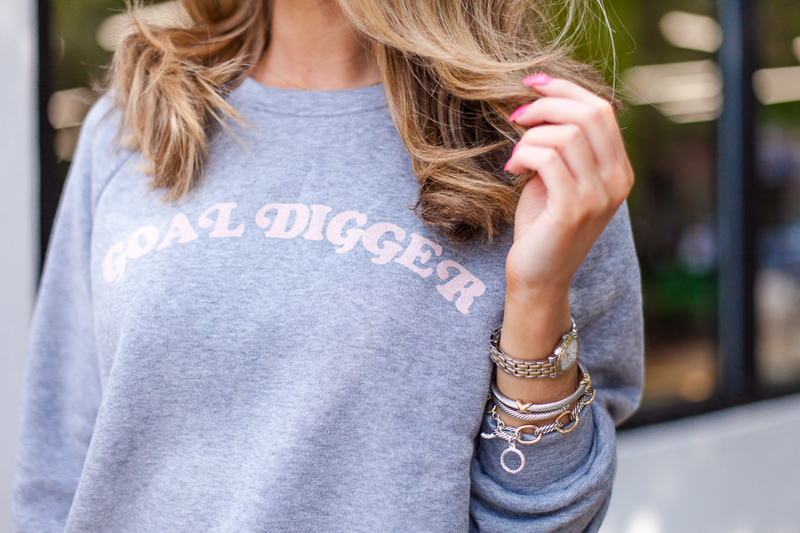 Oh, btw my Goal Digger sweatshirt has a crazy comfy fleece lining and is under $40!